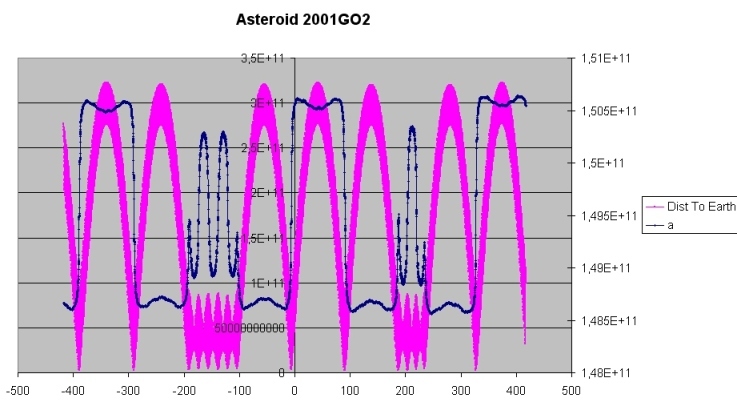 Asteroids are something very interesting to simulate with GS , therefore this new topic . 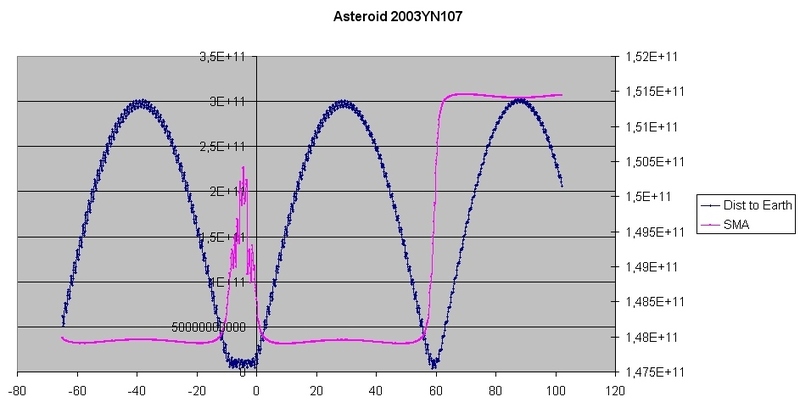 Hereunder a link to the asteroid 2004GU9. The SMA varies a lot and seems to have a cycle of about 70 years . The minima and maxima correspond to the closest approaches to earth . The closest approaches have a period of about 35 years . There must be a connection between the closest approaches cycles and the SMA . I just don't feel by intuition or by maths why the period of the SMA is just the double of the period of closest approaches ... Someone does ? Your intuition is right. They are definately related to each other. This asteroid has a facinating orbit. Thanks for bringing it to our attention. I've wondered if any asteroids could exist in such orbits. I guess they can. I just grabbed its data and simulated it. Appearently, it is trapped in a quasi-orbit around Earth. 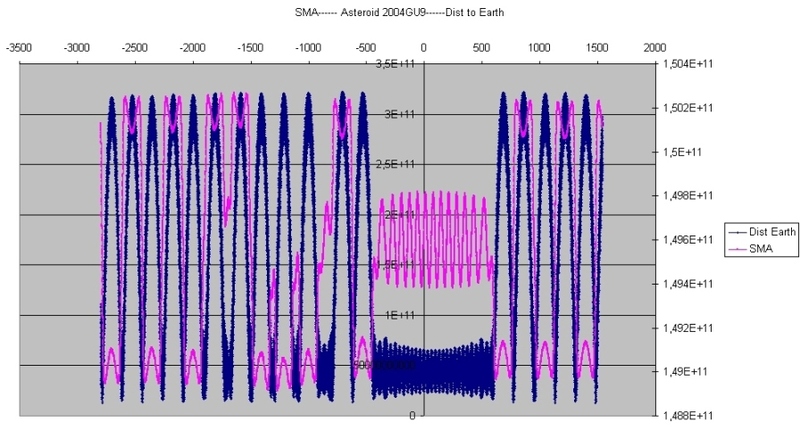 This is similar to 2004AA29, which is featured on the Simulations link: http://www.orbitsimulator.com/gravity/articles/2002aa29.html . But unlike 2004AA29, this asteroid spends a lot more time in the quasi state. Because of 2004GU9's eccentricity, it traces an oval around its average position in the rotating frame. And this oval encompases the oval traced by Earth in the rotating frame. Earth's eccentricity is less, so it traces a smaller oval, as it doesn't venture as far from its average position. This asteroid's semi-major axis is currently slightly greater than Earth's. This means its period is slightly greater as well. Orbit after orbit, the trailing edge of its oval approaches Earth. Earth's gravity pulls it on it in a retrograde direction. This causes its orbit to shrink a little. As its semi-major axis decreases, its period decreases as well. Eventually, its period exactly matches that of Earth's. Earth's gravity continues to pull, lowering the asteroid's semi-major axis and period to less than Earth's. This causes 2004GU9's oval to reverse direction in the rotating frame, as it is now travelling around the Sun faster than Earth. It continues heading in this direction until the new trailing edge approaches Earth. The opposite now happens. Earth pulls it in a prograde direction, expanding its semi-major axis and its period until its period is once again greater than Earth's, causing it to once again reverse direction in the rotating frame. Here's my simulation. Rotating frame is turned on, and set to Earth's period. Here's an animated GIF of~70 simulated years. I re-made your graphs to seperate them, and expand them horizontally to zoom in a bit. Keep in mind, the period of closest approach is not 35 years. It is 1 year. Every year, the asteroid makes a close approach to Earth. But each year, the close approach distance varies, from a minimum to a maximum. This is what has a 35 year period. The zoomed-in graph makes this a little clearer. This graph shows you the state of the system at various points on the graph. Looking at the picture in the moving frame I thought , "waw we discovered earths second moon ". Quite an amazing orbit ! See the nice link http://science.nasa.gov/headlines/y2006/09jun_moonlets.htm . According to NASA it has been there for at least 500 years in this orbit . Asteroid 2004GU9 was in our neighbourhood for the past 500 years , but where was it before ?? Herunder the result of the simulation "at high definition" of the ast. It is clear that about 500 years ago , something happened . The ast was not as closely bound to earth as it is now . The Dist to earth goes up tu around 3.0 E11 m ie twice the SMA of earth . After escaping, it should be in a horseshoe orbit. Examine it in the rotating frame and see. Simulating forward, I find that it leaves its semi-quasi state in the year 2605. And it does indeed enter a horseshoe orbit after escaping. Data were taken from the nasa site hereunder . 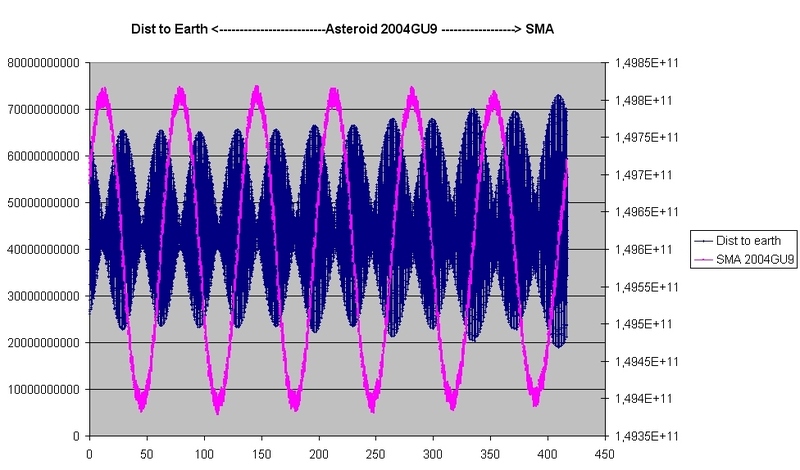 Simulating forwards and backwards from 01/02/2007 on shows that the asteroid is in an horseshoe-orbit around the earth , but will become bound to earth in about 200 years , staying for about 50 years and then going into horseshoe again . Remarkable is the fact that not so long ago it was bound to earth also , after having been in a horseshoe . There seems to be some pattern in it . I wonder what's causing this transition from horseshoe to bound orbit . Is it simple a question of earths gravity , or is it the interaction of venus , or mars or maybe the mighty jupiter ? I think jupiter is strongly involved as due to his enormous mass the force on the asteroid exceeds the forces of the other planets ( not considering the grav filed of the sun ) . You can always delete Venus and Jupiter and try again My guess is that they're not major influences. But don't delete the Sun . Trust me, it's needed or Earth and the asteroid will depart ways forever. Just guess whats running now on my computer ? Blue represents the real SMA of the asteroid . The pink one is simulated forewards , but with Jupiter deleted from now on . The yellow one is simulated backwards with Venus deleted . Herunder a screenshot of the simulation for 2000 years , zoomed into our lifetime . May Earth get a new Trojan ? 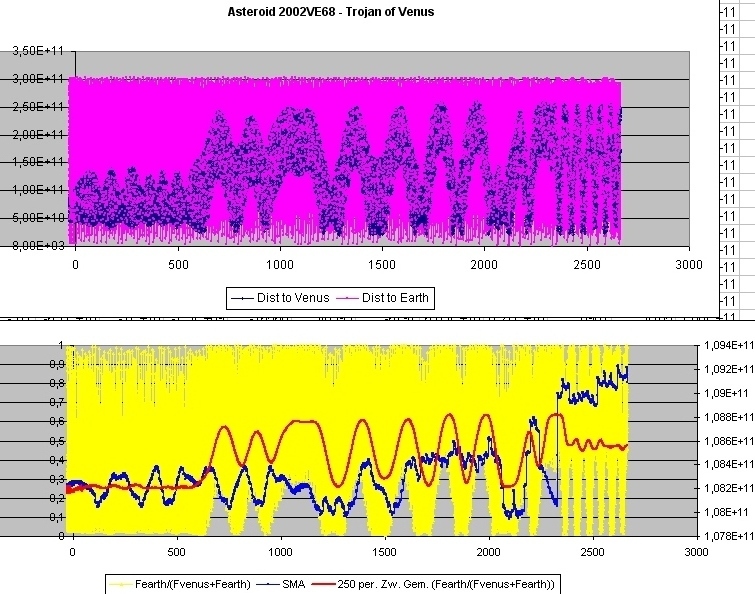 Our sister planet Venus has a real Trojan , Asteroid 2002VE68 , discoverd recently (2002) . It's not really big , but has an unusual orbit which takes it close to the orbit of mercury and earth . Data can be taken from the site http://neo.jpl.nasa.gov/cgi-bin/db?name=2002+VE68 . The upper image makes clear that , although the asteroid is a Trojan of Venus , it spents some time closer to earth than to venus ! . It even came inside the orbit of the moon ! The SMA tends to increase with time . That should bring it closer to earth . I wondered how big is the influence of earth on the asteroid . Just adding numerically (not vector) the forces of earth and venus on the asteroid , and take the ratio Fearth/(Fvenus+Fearth), gives the yellow scattered line . It varies between 0.0.. and almost 1. This means that Earth really has a big influence on the asteroid . The moving average of this ratio ( red line ) makes clear that the ratio really can exceed 0.5 , meaning Earth has a stronger influence than venus . At the end of the sim it seems that 2002 VE68 has settled itself on a ratio slightly under 0.5 . The pictures may seem fluffy due to downscaling in order to get under the 250k limit . Do you guys have gravsim render farms or something? How the heck churning out these sims so quickly?! I have to marvel at the structure of the graphs here too, so regular!